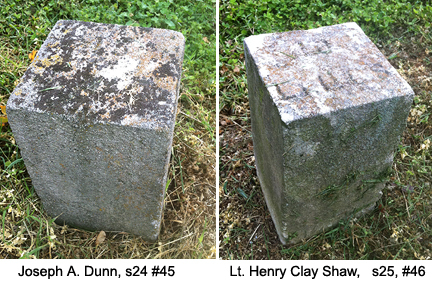 Ea rly dawn found the head of our weary columns fleeing into Franklin. Just after we passed Spring Hill our wagon train was attacked by Rebel cavalry and several wagons burned. The headquarter guards with the train had quite a little battle before the cavalry was driven off. Cousin Shelley was Sergt-commanding. Among the burnt wagons was one containing my valise. Otherwise came through safely though it seems a special providence that our rear was not captured consisting of detached portions of troops and artillery and many wagons. It was a terrible march over a narrow road which was one solid mass of moving trains, artillery and infantry. I completely lost my company in the darkness and crowding. Just as we came in sight of Franklin, I dropped in a fence corner and not particularly caring what happened, I was so worn out. But after a short rest and hearing the firing of our rear guard which was approaching, I went and found a few of my company, and in a short time all of them turned up from various quarters. We drew rations and made coffee and was lined up in position where we proceeded to throw up temporary works as we often had done. Our lines was extended from the Harpeth River above town to the river just below, and of a horse-shoe shape. We rested easy until about 3 pm. Myself and company however were placed out on picket and had dug some rifle pits to spend the night and providing the Rebs would let us. Between 3 and 4 pm the Rebels began showing themselves and our cavalry falling back. There was no skirmishing by us for the Rebs formed two lines of battle and came dashing out of the woods in fine style, a skirmish line in front and one in the rear. I yelled to my skirmish line to fall back to the works and started myself. Finding I had to cross the range of one or other of two cannons that were planted at angles, I chose my chances to go between them. The cannoneers were excited and not time for one man to get out of the way. When such a good mark as those advancing columns, I gave a leap at the instant. 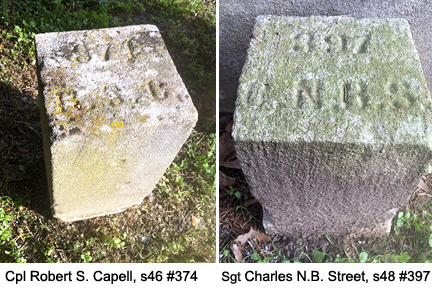 The pieces were discharged and repaired to my company and loaded guns while the men fired. When the advancing line came up within range the infantry behind the works , a sheet of flame leaped forth with death and wounds in it for hundreds of the brave men fighting for an ignoble cause . The whole scene of action was soon covered with smoke that but little could be seen in detail. 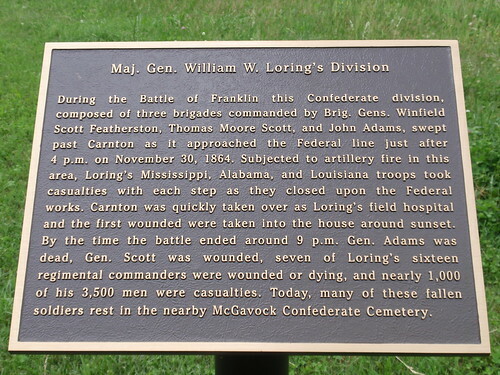 For about a dozen times the Rebs was led to charge, only to be repulsed with great slaughter. Many of their banners were planted upon our works with the most heroic determination but was met with as determined resistance. The fight lasted for three hours and while it was going on a Reb and Union battery were having a duel overhead with their shells and shot which sometimes passed distressingly low over our heads. At eleven o’clock we were withdrawn and crossed the river on a pontoon and railroad bridge. The Enemy discovered our retreat and came crowding down the streets of the town. Our guns opened up on them and must have done them considerable damage. 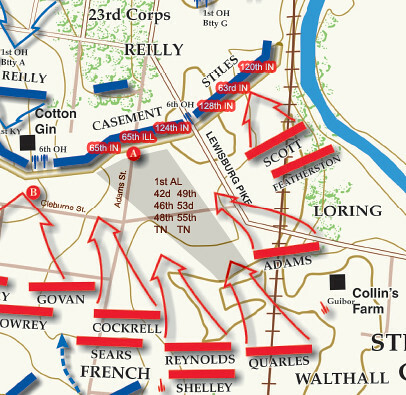 The bridges were burned by our forces and they started on their third night march towards Nashville, near which place cavalry firing again commenced . We arrived in range of its big guns and forts very very tired, though rejoicing in possession of 18 captured colors and near 3,000 prisoners. 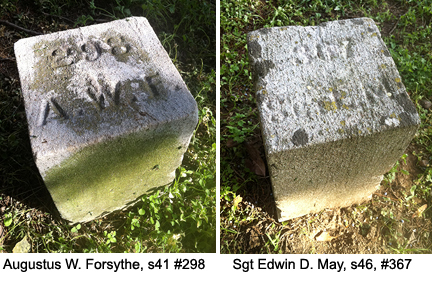 Fort Granger has three bastions. The map shows the location of each one. a projecting work in a fortification designed to permit fire to the flanks along the face of the wall. When entering the fort from the parking lot one walks right up to the middle bastion. You will be standing facing the MIddle bastion, looking south. Armament (i.e., artillery) was placed in the cul de sac of each bastion. There were 30 pounders in Granger. Each bastion sits roughly 15 feet from the ditch on the outside. 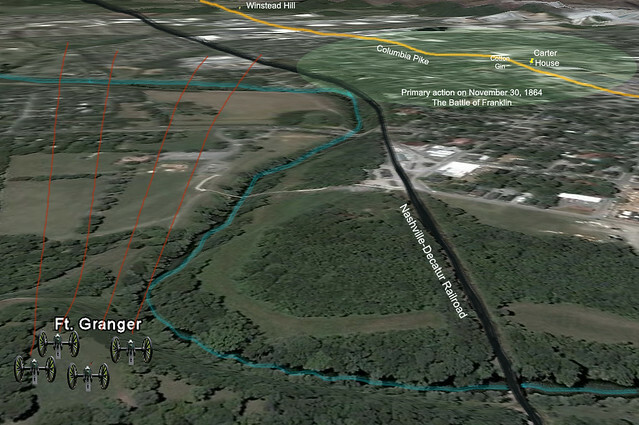 This Google map shows the relative position of Fort Granger in the larger scope of the battlefield (Franklin). 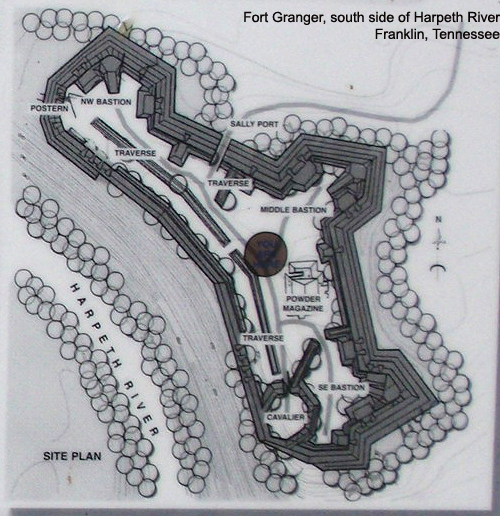 Notice the Harpeth River running in front of the fort and the railroad to the west side (running north/south). 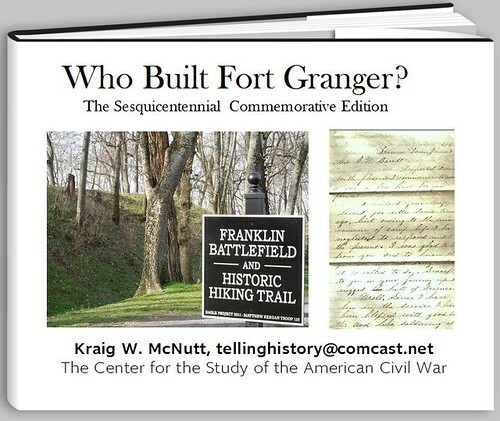 The Eastern flank portion of the Franklin battlefield was in the direct spray of artillery from Granger. Thus, Loring’s Division, and more specifically, Featherston’s Brigade, took the worst of the Federal onslaught of artillery from Granger. Here is a video showing the middle bastion just as you enter the fort. NASHVILLE – Tennessee Gov. Bill Haslam and Tennessee Department of Transportation (TDOT) Commissioner John Schroer joined state and local leaders today to announce the award of a $500,000 transportation enhancement grant to the city of Franklin for the Eastern Flank Battlefield Access Improvement Project. 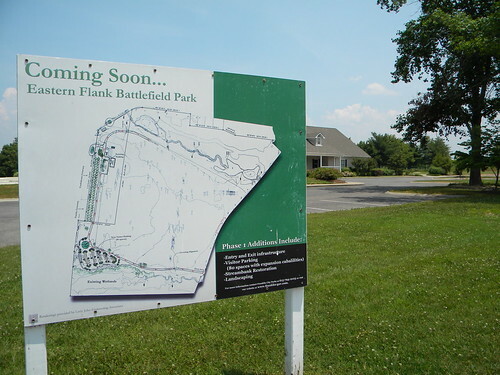 The Eastern Flank Battlefield Access Improvement Project includes the construction of an access drive from Lewisburg Pike to the Eastern Flank Battlefield property. The project also includes visitor center parking, interpretive trail network, landscaping, bike racks, signage, bio-retention area and other pedestrian amenities. The grant is made possible through a federally funded program administered by TDOT. A variety of activities such as the restoration of historic facilities, bike and pedestrian trails, landscaping and other non-traditional transportation projects are eligible for grant funds under the federal program. State Sen. Jack Johnson (R-Franklin) and state Reps. Glen Casada (R-Franklin), Phillip Johnson (R-Pegram) and Charles Sargent (R-Franklin) represent Williamson County in the Tennessee General Assembly.